The cupcakes are done! The cupcakes are done! Only about a week late! not bad, I think. These are gifts for the guys in #1 Son’s band. 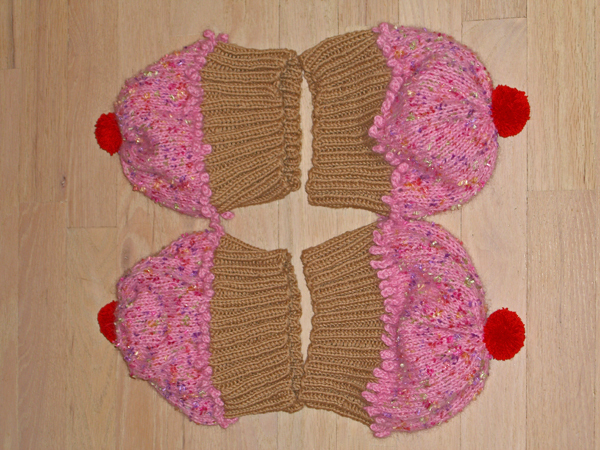 No, I don’t know yet what a punk band is going to do with four cupcake hats. #1 Son has promised pictures, and I will pass them along. I made a few changes to the pattern. Since my hats need to be adult-sized, I cast on 88 stitches and used US#7 needles. I knit the cake part for 3″ and the frosting for 4″ before beginning the decreases. About 1/2 way into the “nubble” row (the dripping icing edging) on the first cupcake, I realized that knitting 44 little nubbles would be the death of me, so I crocheted them. In other crafty news, I’m still turning cables on the Sockapaloooza socks. I’m thinking of getting started on the sock pattern I promised Alice at Tangle. But good intentions are being derailed by a bag idea. Stay tuned. I visited Kidd in the kitty hospital today, and he’s looking pretty chipper. He’d eaten some solid food. Dr. Specialist believes he will be able to come home tomorrow. Moo Cow is missing him, and so am I!